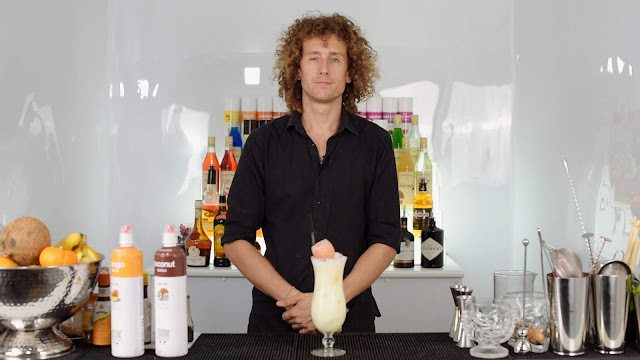 In this fifth edition of our monthly cocktail recipe blog, two-time flair bartending world champion, Tom Dyer, guides you through the steps you need to follow to make a deliciously rich, egg-based ‘huevos colada’. This unique recipe is quick and simple to make, thanks to the addition of the ODK coconut and mango purees. This recipe is also a great example of how the ODK purees can be used to make interesting garnishes – as well as for packing your cocktails with exotic flavours. More than just another cocktail ingredient, the ODK purees boast a superb three-month shelf life, incredible convenience and a delectably fresh taste - making them fond favourites of bartenders all over the globe. So, what do you need to make Tom’s lip-smacking huevos colada? Fill your hurricane glass to the brim with cubed ice. Pour both your Sailor Jerry and Malibu rum into the smaller Boston shaker can using spirit pourers. Pour the entirety of your milk into the can using a milk pitcher. Squeeze half of a lime into the can with a handheld lime juicer. Crack your egg on the side of the Boston tin. Separate and add in the egg white, then throw away the yolk. Remember to keep hold of the eggshell for garnishing later! Squeeze in the ODK coconut puree and fill the can to the very top with cubed ice. Lock the larger Boston shaker tin into the can and shake vigorously for around 3-5 seconds. Make sure you don’t shake for too long, as this can dilute the flavour of your drink. Unlock the shaker and strain into your glass using a hawthorne strainer. Top off the glass with dashes of soda water and angostura bitters. Delicately place your eggshell on the top of the drink. Squeeze the ODK mango puree into the empty shell. This can be mixed in with the drink if you want to add some extra flavour. Finish off the drink with a straw. Your mouth-watering huevos colada is now ready to serve!